Marie Isabell Reinhold is a happy 33 year old from Amager in Copenhagen. She was scouted to be in Dansk Melodi Grand Prix in a very modern fashion: it was via Instagram she was discovered! Not long ago Marie Isabell uploaded a video of her covering Anouk’s (The Netherlands 2013) most famous hit ‘Nobody’s Wife’, showing she has a rockier side as well! But that’s not all she does in daily life, in fact, Marie Isabell gives her all as she tries to make the daily lives of the Danish senior citizens better! She works as teamleader in an elderly home in Copenhagen Municipality where she uses her talent for music to achieve that, amongst other things by singing for them when she visits them and by giving a daily singing lesson! Right now, the preparations for Dansk Melodi Grand Prix are in full swing for Marie Isabell as well, but still she found time in her busy schedule to talk to us! 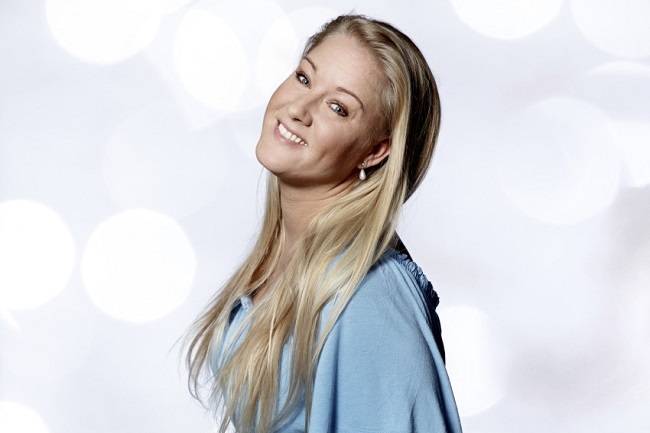 Hey Marie Isabell, congratulations on being chosen to compete in Dansk Melodi Grand Prix! Why did you decide to take part this year? Could you tell us what your song ‘Dancing With You in My Heart’ is about? Can you share with us what your staging will be like? My dress is gonna be so lovely. It is going to be colourful in a different way! We’ve read you work in an elderly home where you also sing for the people living there. How does it make you feel to be able to use your talent to make people happy in such a way? And is that something you want to build on after Dansk Melodi Grand Prix as well? If I win, I hope to use my music to put some focus on the care of dementia. And maybe create some kind of focus on music therapy. I would like to play music in nursing homes with my guitarist: Anders Brandt. I’m using his music talent and my knowledge of dementia to build a happy space for sick, old and lonely people. If you win Dansk Melodi Grand Prix, how do you think you would react? And what would it mean to you to represent Denmark in the Eurovision Song Contest? I think I am probably gonna cry if I win! I don’t think that’s gonna happen but if I do, which I really hope, I don’t know what’s gonna happen, that would be so crazy! Right here you can hear Marie Isabell’s song ‘Dancing with You in My Heart’, which she will be singing as #4 tomorrow evening! Thanks a lot for this interview, Marie Isabell, and we wish you the best of luck, both tomorrow night and in the future! If ‘Dancing with You in My Heart’ is one of your favourites in Dansk Melodi Grand Prix 2019, you can cast a vote for it in our poll! Ann-Louise Hanson: “We were convinced Abba would win”.